Roman Totenberg, virtuoso violinst, beloved teacher, has died at 101. 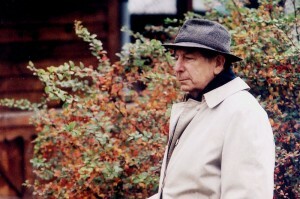 Roman Totenberg in Poland, 2000. Photo: Tomasz Skowronski. Wikimedia Commons image. I am saddened to inform you of the passing of our esteemed colleague and dear friend, Professor Emeritus of Music Roman Totenberg. A survivor of two world wars, Roman offered the world hope and love through his extraordinary music-making. First guided in his art by 19th century masters such as Flesch and Enescu, his legacy is a testimony to the power of human strength and resilience. Throughout our long and wonderful relationship with him, he always kept BU and its students in his heart; now, we will forever hold him in ours. We are so grateful to have known such a unique and generous artist and human being; more than a virtuoso, he was a true global citizen who bridged three centuries with his artistry and teaching. Details of his memorial service will be posted here when they are announced.